Mug shots can be probing statements of social mores gone wrong. You look at the face, the expression, hairstyle, and age-lines – all that tell a piece of the story. You wonder what sordid history and events led up to the individual’s incarceration. Anyway, seeing this guy with a Pi tattoo makes this Physics Groupie hypothesize about exactly what it means to this man. Was he a scientist brought down by a stint of academic rage? Was he a gang member whose hijacked moniker was the result of an ill-informed street credo? 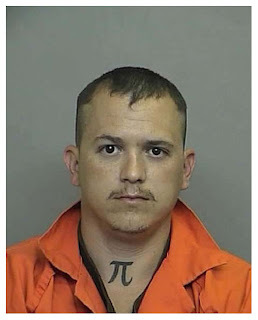 Did he select the Pi symbol from a catalog late one night on a drunken binge? What do you think? i think he's just a thug who thought the symbol looked cool but had no idea what it meant imho.